Custom Furniture, Unfinished, Finished and Real Wood! Welcome to Your Online World of Custom Finished & Unfinished Furniture! Enter your own world of unfinished furniture available for you just the way you want it. The endless search for furniture your way ends here. Point and click to reveal the unlimited possibilities available to you. Where we will custom paint, stain or specialty finish real wood furniture the way you want to achieve a unique and affordable home furnishing experience. Express your individuality through our unique designs and wide selection of finishes. You no longer have to imagine. Combine, create, and enjoy a look that is all your own. Have the Furniture Gallery do the work for you or create your own custom furniture masterpiece! 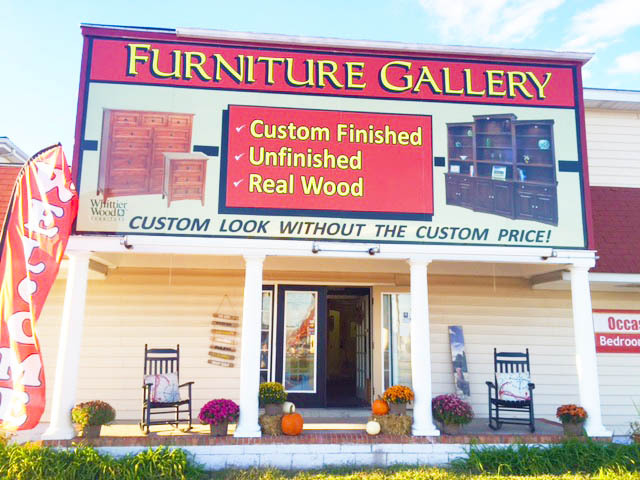 The Furniture Gallery offers numerous custom wood furniture finishes with premium stains and paints in a variety of popular colors. You can use these stains and paints to finish your furniture yourself or let our in-house finishing department finish your piece for you. Ask our expert creative staff to help you add just the right color to set your custom furniture piece apart from the rest.